The US vice president reiterated that the North Korean government poses threat to Washington's allies in the region. WASHINGTON (Sputnik) — US Vice President Mike Pence said during a joint press conference with Japanese Deputy Prime Minister Taro Aso on Tuesday that the United States will continue to work with its allies to deal with the gravest threat to the region emanating from North Korea. 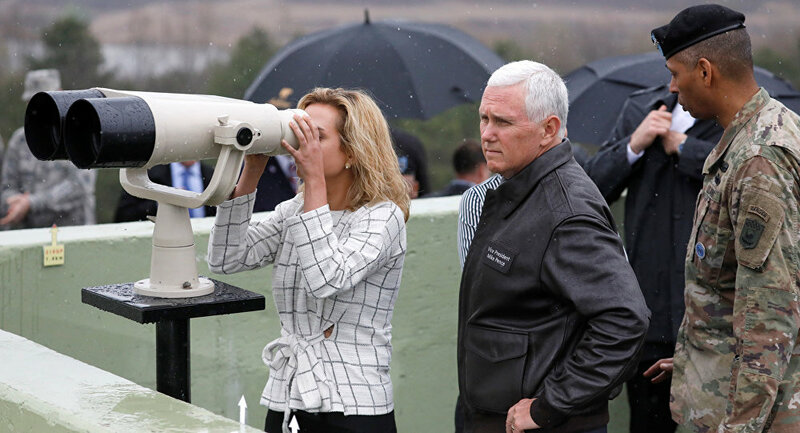 "[T]he United States will continue to work with Japan and with all our allies in the region, including South Korea to confront the most ominous threat posing this region of the world, the regime in North Korea," Pence stated. Pence noted that all options in dealing with North Korea are currently on the table and will remain on the table. The most productive way to deal with North Korea is to have all US allies in the region isolate and pressure the North Koreans into permanently getting rid of both its nuclear and ballistic missile programs, Pence added. On April 17, Pence said during his visit to South Korea that US military strikes on enemy forces in Afghanistan and Syria show the shift in Washington's strategy to halt North Korea’s nuclear and ballistic missile programs. On April 14, US media said that Trump might order a strike against North Korea in the event Pyongyang decided to carry out another nuclear weapon test. The reports came after Trump said that the North Korean nuclear issue would be "taken care of," while at the same time calling on China to pressure its neighbor into giving up its nuclear program. In response, the general staff of the North Korean armed forces threatened to launch a strike against US military bases in Japan and South Korea, as well as the presidential residence in Seoul in case of US aggression. On April 15, North Korea reportedly test-launched a missile but the experiment failed. In March, US State Secretary Rex Tillerson said that Washington might consider broader sanctions against North Korea. Since the beginning of 2016, North Korea has carried out a number of missile launches and nuclear tests, prompting worldwide criticism and high tensions on the Korean peninsula.